CAUTION The control valve lever must never be held or left in any position between 1 and 2 or 2 and 3, since this allows fluid to drain from the accumulator, through the system, to the gravity tank. The power package accumulator does not contain sufficient fluid to raise and lower the stanchions more than three times without the pump operating. 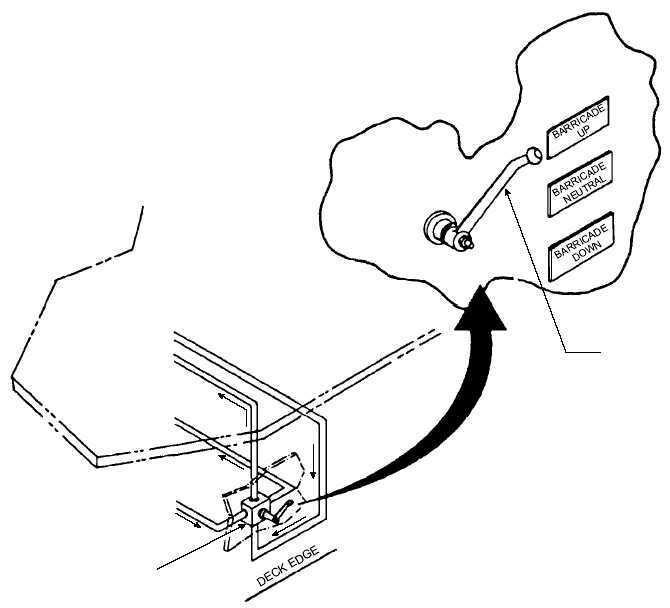 Approximately 20 minutes is required for the pump to replenish fluid to the operating level in the accumulator, if stanchions are cycled three times without the pump operating. The READY CONDITION for normal operation specifies 1,500 psi accumulator pressure; however, stanchions will raise and lower, taking a longer period of time with a lower pressure, as is experienced if stanchions are cycled without the pump operating. Pressure at the start of the third cycle will be approximately 850 psi without the pump operating. If the stanchions are cycled more than three times without the pump operating, air will enter the piping and cylinders, and fluid will overflow the gravity tank. It is then necessary to fill, vent, and charge the system as specified in the applicable operating manual. During the READY and SECURE conditions, the following checks are to be made: 3-44 CONTROL LEVER CONTROL VALVE (4-WAY) ABEf0346 Figure 3-46.Barricade stanchion controls.